It's been a while since I delved into the vault. Today I took a peek and found an old Blue Jays schedule from the 1988 season. A drawing of 1987 American League MVP George Bell is on the cover and that must be why I kept it. Here it is. 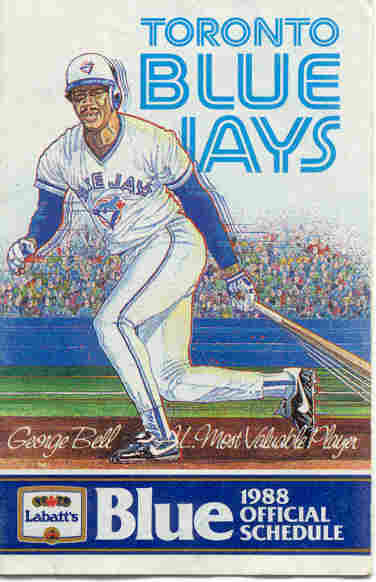 When George Bell hit 26 homers in '84, he instantly became my favourite Blue Jay. I was all about #11, closely reviewing the daily boxscores to see how he was doing compared to others in the league. What I remember the most is how impressive 26 home runs seemed at the time. Today, 26 homers would be disappointing for a major league slugger. George Bell went on to hit 47 in his MVP season of '87. Every year I secretly root against those Blue Jays who approach this franchise record. In '98 Jose Canseco came close with 46, but Bell is still the Blue Jays boss when it comes to single season home runs and he remains the only Jay to win MVP honours.